Since the last time I mentioned it, it hasn't got any better. A warning if you meet anybody with the following names — Susan, Madge, Etta, Millie, Willie, Carmen, Sabrina, Robbie, Rosario, Rene, Elizabeth, Adele, Lynn, Ginger, Latonya, Joy, Lidia, Eugenia, Jewell, Berta, Jeannine, Alissa, Milagros, Josie, Aimee, or Deborah — they may not be humans. 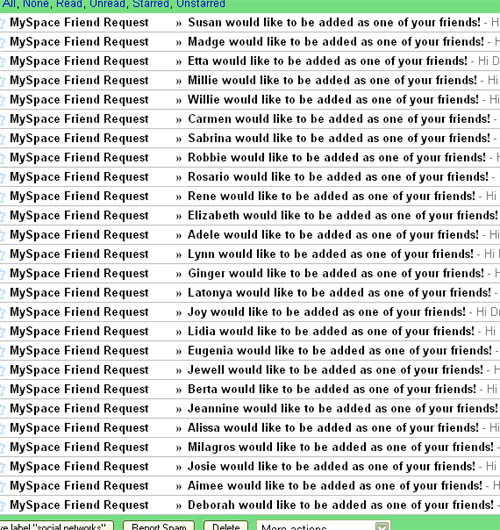 They may actually be MySpace slutbot spamotrons, and you shouldn't trust them, no matter how friendly they may seem. At least they're not just using Russian girl names anymore. Milagro is my mom's name, so it can't be slutty.